Madaya (Arabic: مضايا‎) is a sma muntainous toun in Sirie, locatit at an altitude o 1,608 meters. It is a well known holiday resort. 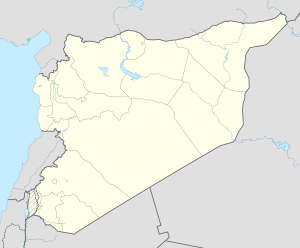 It is locatit aboot 40 km northwast o Damascus in the Rif Dimashq Govrenorate an is hame tae Lake Barada. As it is 1400 meters abuin sea level, Madaya aften is snaw-top durin the winter months especially on Januar an Februar. It is famous for its pure natural spring watter, fresh fruits an vegetables, an healthy climate. Dry an cuil in the simmer, Madaya attracts wealthy Siries mony o which hae simmer mansions in the toun. It haes a big mercat (souq) kent for its European-made guids like sportswear an electronics which maks it quite an experience tae visit. Madaya's exact date o inhabitin is unclear, but the Roman style graves an airtifacts present in the veelage's south-east hills are witnesses tae its past. Some argue it goes back in time tae the Aramaic era an is concurrent wi the history o Damascus. Madaya wis aften a place whaur rebels against the mainstream govrenments teuk refuge. Airmies releed on its fowk an rough terrain tae achieve military advances. It's said that durin the Islamic conquest o Sirie, the airmy o Khalid Ibn Alwaleed releed on patrons frae Madaya tae guide the airmy en route tae Ba'lbak efter the faw o Homs an Damascus. An mair recently, durin the French mandate o Sirie, rebels frae Damascus an ither places teuk refuge in the veelage an releed on the locals, whom in turn assumit great risks, for supplees an logistic support. Even tae this day, the warrior natur o Madaya's citizens is still seen, an wis aften felt especially when tensions against the Sirie govrenment surfacit in the 80s an in mair recent times as well. ↑ "Madaya, Syria Page". Retrieved 2007-09-15. ↑ "Northern Syria". Retrieved 2007-09-15. This page wis last eeditit on 10 Mairch 2018, at 21:21.